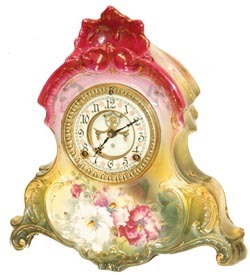 Ansonia Clock Co. Royal Bonn, "La Normandie", C. 1904. This is an exciting case to study. The designer surely had fun that day. Shell design on top, open figure eight, and the many loops and curls all the way to the bottom. No breaks, chips, or repairs to this good looking case. Beautiful large flowers painted front and sides, gold accents as always, used in just the right places. The case is properly marked and signed on the back of the case, the movement, and the dial. A large case at 13.5" high and 13" wide. Colors are Ruby on top changing gradually to green at the base. 8 day movement, striking half hours on a standing gong. French sash, beveled glass, 2 piece porcelain dial with open escapement, correct hands, and runs very good. The pendulum and back door cover are correct. I questioned the dial with fleur de leys between the numerals, but the catalogs show this style dial with this model clock. Ly-Ansonia, page 611.